Groomed by the “respectable” right, Kavanaugh will grease the skids for the Trump agenda. Trump’s much-anticipated replacement for “swing” justice Anthony Kennedy has finally been chosen. Those who viewed Kennedy as the Supreme Court’s moderating force, a voice of restraint and pragmatism, will be happy to know the nominee has Kennedy’s personal seal of approval. Those who know more about Kennedy’s actual record will not find this comforting in the least. Brett Kavanaugh, the man slated to be Kennedy’s replacement, is a Bush appointee who leapfrogged onto the US Court of Appeals for the D.C. Circuit in 2006 due largely, it seems, to his fierce loyalty to former president George W. Bush. It took him two attempts and three years, but Kavanaugh was finally confirmed, despite Democratic opposition, on an almost entirely party-line vote. This exact course of events now looks set to repeat itself. So, who exactly is Brett Kavanaugh? Turns out there’s nothing particularly Trumpian about him. Instead, Kavanaugh is a right-wing radical entirely of the establishment’s making. What’s immediately clear about Kavanaugh is there is absolutely nothing aberrant about him. Kavanaugh isn’t a forum-posting extremist dredged up from some obscure right-wing fever swamp in the mold of Stephen Miller. Nor is he some kind of wacky fundamentalist from one of the US’s supposedly backward regions. Kavanaugh’s brand of radicalism is a product of the Washington establishment through and through. Kavanaugh was born in D.C. and grew up in Maryland. His mother was a public school teacher who later became a state judge. He went to school in Georgetown Prep., one of the country’s oldest and most elite schools, before attending Yale. He cut his teeth as a summer associate at some of Washington’s biggest and most powerful firms, including Pillsbury Madison & Sutro (now Pillsbury Winthrop Shaw Pittman), Covington & Burling, and Williams & Connolly. He clerked for Kennedy, which makes him the second of Trump’s far-right picks to have done so (Gorsuch, incidentally, also attended Georgetown Prep. ), before diving headfirst into service for the GOP. Kavanaugh fits a consistent pattern. For all the panic over Trump’s appointment of fringe figures like Miller and, previously, Steve Bannon, Trump’s extreme picks often come from the more socially acceptable confines of establishment conservatism. On the bench, Kavanaugh has been described as a “foe of government regulation.” To understand why, we need only look at his family history. Kavanaugh’s father, Edward Kavanaugh, was for two decades the president of, and a lobbyist for, the Cosmetic, Toiletry, and Fragrance Association (or CTFA, later renamed the Personal Care Products Council), a more-than-a-century-old trade association of hundreds of cosmetics and personal care companies. Heading it made the elder Kavanaugh a very wealthy man; by the time he stepped down, he was one of the best paid heads of a nonprofit organization, raking in an annual salary of nearly $2 million. Years later, he would admit that talc — which for years the CTFA had puts its resources toward defending — causes ovarian cancer. Methylene chloride, a widely used solvent whose regulation the CTFA under Kavanaugh worked to block, was finally declared a health risk by the EPA decades later. These are only a few examples of the hazardous chemicals Kavanaugh’s father devoted his life to exposing the American public to. These credentials made the younger Kavanaugh a good fit for Republican politics, which has facilitated his climb up the judicial ladder. He first made his name in the 1990s as part of independent counsel Kenneth Starr’s investigation of then-president Bill Clinton, becoming the lead author of the 1998 Starr Report that outlined the case for Clinton’s impeachment. During this time, he also argued unsuccessfully in front of the Supreme Court that attorney-client privilege didn’t apply when the client had died, in an attempt to seize notes of a conversation between White House staffer Vince Foster and his lawyer. Starr’s team was stacked with young lawyers (including Kavanaugh) who were involved in the Federalist Society, the conservative judicial group that has made tilting the courts rightward its decades-long mission. Between 1999 and 2000, he served as co-chair of the Federalist Society’s School Choice Subcommittee of Religious Liberties Practice Group, which gives a good indication of his positions on both public schools and “religious liberty,” as it’s defined by conservatives. During this time, Kavanaugh became a partner at law firm Kirkland & Ellis, where, according to his 2004 confirmation hearing, his major clients included Verizon, Morgan Stanley, and General Motors. He defended the latter in a case where a design defect in the roof of a car left a man quadriplegic after a high-speed crash, and he defended then-Florida governor Jeb Bush’s voucher program, the first of its kind, which put public money toward tuition at private religious schools. Kavanaugh also represented Cuban child refugee Elian Gonzalez’s relatives pro bono to help the boy claim asylum in the US — work that more likely reflected his and the Right’s distaste for Cuba than any sympathy for asylum-seekers. After working for Bush in the infamous Florida recount episode, Kavanaugh was brought into the fold of the new president’s administration. He drafted Bush’s Executive Order 13233, which gave presidents and vice presidents new, radically broad powers to restrict public access to their public records, which caused an outcry from historians, publishers, and archivists. The irony was not lost on critics that when it was a Democrat in the White House, Kavanaugh had worked to open the presidency up to greater scrutiny, not less. Adding a further layer of irony is the fact that, as former ThinkProgress reporter Laurel Raymond pointed out, Kavanaugh would later write that the job of president was such a hard and stressful one that presidents should be immune from civil suits, criminal prosecution, and investigation while in office. During his 2004 confirmation hearing, Sen. Patrick Leahy recounted how a week after the September 11 attacks, Kavanaugh came to Capitol Hill as a representative of the Bush administration, putting forward legislation immunizing airlines from liability while offering no compensation for the victims. Through the course of his questioning, Leahy repeatedly tried to get a stonewalling Kavanaugh to say what position he had taken in discussions with lawmakers about whether to compensate the victims. “Mr. Kavanaugh, I was there,” said Leahy. “You are under oath.” He never did get an answer out of him. Probably Kavanaugh’s most important task, however, was as point man for Bush’s campaign to tip the US courts rightward. Kavanaugh was intimately involved in selecting right-wing nominees and preparing them for confirmation battles. The nominees produced by this process included a judge who wanted to bring back the Lochner decision, one who wanted to overturn Roe v. Wade, and one who was hostile to voting rights but had been unusually lenient to a man who left a burning cross in front of an interracial couple’s house. In return for his loyalty, in 2004 Bush nominated Kavanaugh to sit on the D.C. Circuit court, generally considered the country’s second-most powerful, despite his lack of experience. Due to Democratic opposition, Kavanaugh had to be nominated twice and go through two separate confirmation hearings. Each was a masterclass in obfuscation and stonewalling, as for hours, Kavanagh refused point-blank to answer frustrated Democrats’ questions about his legal views and his actions in government. This led the New York Times, on the eve of his confirmation, to publish an op-ed calling Kavanaugh “unqualified” with “paltry courtroom experience,” and a blatantly political appointment. It was a far cry from the op-ed the Times published yesterday, almost as soon as Kavanaugh was nominated to the Supreme Court, which declared that “it is hard to name anyone with judicial credentials as strong as” his. Unsurprisingly, Kavanaugh has largely adjudicated on the D.C. Circuit court how both his supporters and critics expected him to. According to political scientist Adam Feldman, the vast majority of Kavanaugh’s opinions reviewed agency decisions, and he “has written almost entirely in favor of big businesses, employers in employment disputes, and against defendants in criminal cases.” It’s perhaps not surprising from the son of a man who viewed the FDA as something akin to his personal nemesis. Center for Biological Diversity senior counsel Bill Snape told Buzzfeed Kavanaugh was “pretty consistently anti-environment on every front.” Indeed, one of his first decisions on the bench was to vote against overturning a Bush-era EPA rule that prohibited state and local governments from putting in place more stringent monitoring of pollution than the EPA — a reversal of the usual conservative hostility to federal usurpation of state and local authority. The D.C. Circuit court went on to hand the Securities Exchange Commission a series of defeats, including a Dodd-Frank-based rule that made it easier for shareholders to get rid of company directors. Kavanaugh dissented when the court didn’t strike down Dodd-Frank provisions, such as the creation of the Consumer Financial Protection Bureau. With Kavanaugh’s help, it has also taken aim at limits on political donations. Kavanaugh has also been evasive on the issue of torture. When Leahy questioned him about what he thought of Bush’s 2006 signing statement that effectively invalidated the McCain amendment against torture of detainees, he didn’t answer the question and played down its significance. He then avoided giving a straight answer as to whether or not the president could “authorize or excuse” torture of prisoners. When Chuck Schumer asked during the same hearing if Kavanaugh supported the nominations of William Haynes and Jay Bybee to be federal judges — two of the primary legal architects of Bush’s torture policy, who were also made judicial nominees while Kavanaugh was leading Bush’s face-lift of the courts — he again repeatedly dodged the question, running out the clock. None of this bodes particularly well for anyone hoping to prevent the return of officially sanctioned torture. These are just a small fraction of the hundreds of cases Kavanaugh has ruled on over the past twelve years, and a fuller analysis of his record in the days and weeks to come will surely reveal more unplumbed, disquieting details. But even this is enough to see why opposing his confirmation is an urgent task for the Left. It would be comforting to blame Kavanaugh on Trump, as people do for most bad things these days. 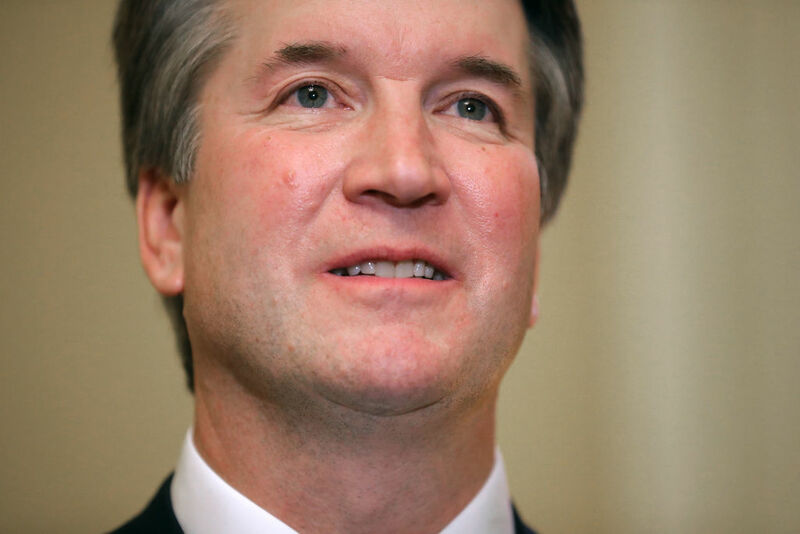 But Kavanaugh is a child of the Washington establishment, and he owes both his judicial career and his current nomination to the two conservatives whom many liberals and centrists have of late elevated into something akin to folk heroes: George W. Bush and Anthony Kennedy — the latter of whom, according to Politico, was instrumental in leading Trump to nominate his former clerk. This is why nominally anti-Trump conservatives like Bill Kristol — who have also been embraced recently in some liberal circles — are celebrating this latest action. Kavanaugh will most likely deliver another brilliantly evasive performance at his hearings and be confirmed on an almost strictly party-line vote, pushing the Supreme Court even further right. But when he starts working with the other right-wing justices to gradually dismantle the twentieth century from the bench, remember: it wasn’t Trump who did this; it was establishment conservatives.